In August 1976, the index mutual fund was born when Vanguard Group, under the leadership of Jack Bogle, launched its First Index Investment Trust with $11.3 million in assets. Last month, “Bogle’s Folly” turned 40, and the Vanguard 500 Index Fund’s assets stood at $252 billion, part of an index mutual fund and exchange-traded fund universe that now has nearly $5 trillion in combined assets, according to The Wall Street Journal. The Bernstein publication deserves praise for the sensationalism of its headline—garnering media attention from the likes of Barron’s, CNBC and Bloomberg—and nothing else. It’s a rambling treatise ranging from Marxist principles of social planning to an 18-page analysis of the economics of mining companies. It’s been so widely derided that additional criticism would just be piling on. In fact, it’s so devoid of anything resembling a coherent thought that it hardly merits a response. Yet respond we must—but in the context of the larger issue of active versus passive management. Writing in the Financial Analysts Journal in 1991, Nobel laureate William Sharpe penned a brilliant essay, “The Arithmetic of Active Management.” In this proof, you won’t find any Greek letters or incomprehensible math equations. 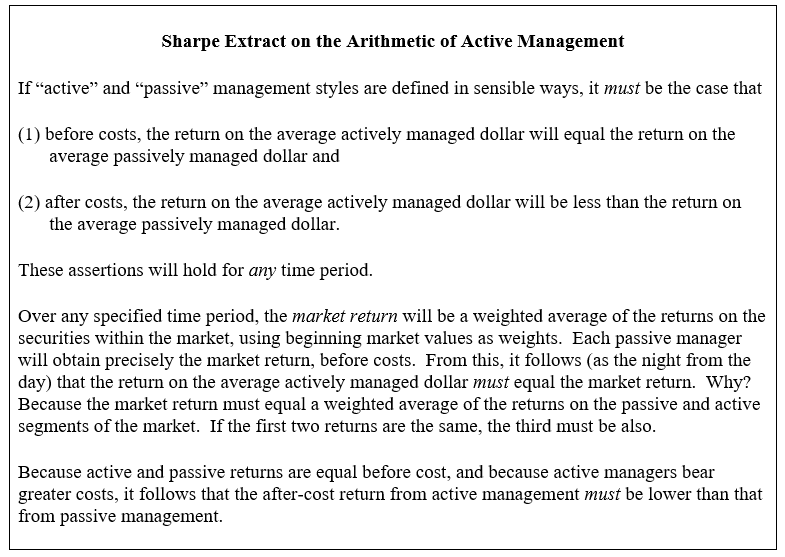 Instead, you’ll discover a delightfully short, simple and irrefutably logical explanation of why the after-cost return from active management must be lower than that from passive management. What else is there to say, other than Q.E.D.? It really does speak for itself. In An Essay on the Principle of Population (1798), the English cleric Thomas Robert Malthus predicted a grim future, with the population increasing geometrically and doubling every 25 years while food production grew only arithmetically, resulting in famine and starvation. This dreaded “Malthusian Trap” never happened. The Malthusian Trap is an example of the timeless principle of the unsustainable trajectory. In one colorful example, “The Great Horse Manure Crisis of 1894,” The Times of London newspaper predicted, “[I]n 50 years, every street in London will be buried under nine feet of manure.” That also never happened. But Bogle is also quick to add that indexing would have to grow immensely from today’s levels—with passive funds representing at least 90% of the market—before such chaos would arise. Vanguard’s 20 million investor-clients own more than $3 trillion of passively managed index funds. The funds managed by Vanguard, a large slice of the passive pie, represent about 6% of total U.S. stock market value. This net outflow from actively managed funds is the natural consequence of bad performance relative to a benchmark index. We will refrain from a typical statistical recitation of what percentage of actively managed funds in any particular category underperform a passively managed index, because (i) it’s unnecessary, and (ii) Sharpe has already enlightened us as to why this will always be the case: costs. 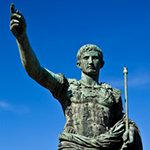 It seems fair to conclude that investors have already crossed the passive management Rubicon, and there is no turning back the tide of indexing. But will we ever reach a situation where 100% of the world’s equity investments are passively managed? No. This type of reasoning is an example of the reductio ad absurdum logical fallacy. If something is on an unsustainable trajectory, what happens? Clearly, it will not be sustained. Efficient capital markets provide an important social good. Among other virtues, they promote price discovery (ensuring that prices are fair for both buyers and sellers), drive transaction costs down, enable the public to participate with confidence by investing their savings, enable promising new companies to raise substantial amounts of capital at low cost, and allow stronger companies to acquire weaker companies and then redeploy capital more productively. But how much active management does society require to provide the vital function of price discovery? Morningstar columnist John Rekenthaler notes, “[I]f 90% of the world’s stocks became owned by index funds … there would still remain $7 trillion invested actively. That would seem to be enough money to conduct the task of valuing the world’s businesses.” We agree, but we also don’t think we’ll get anywhere close to that level any time in the foreseeable future. Can Some Active Managers Outperform? Is it possible for some active managers to outperform the market, even after costs? Yes, of course. We know this empirically because there are some outstanding managers with the track records to prove it. But it’s exceedingly difficult to accomplish. Such [outperforming] managers must, of course, manage a minority share of the actively managed dollars within the market in question. It is also possible for an investor (such as a pension fund) to choose a set of active managers that, collectively, provides a total return better than that of a passive alternative, even after costs. Not all the managers in the set have to beat their passive counterparts, only those managing a majority of the investor’s actively managed funds. So what do these outperforming active managers look like? We know they can’t be index huggers, because the math doesn’t work. Let’s look at an illustration where 75% of a portfolio is replicating a stock market index, and the remaining 25% is the “active share” that deviates from the benchmark. To overcome a 1% fee burden, the active share has to generate at least 4% a year of “alpha,” or outperformance (25% x 4% = 1%). In a hypothetical world of 8% stock market returns, a manager’s active selections would therefore need to generate a return of 12%—or 50% higher than the market—just to cover its costs and break even. Is it possible? Yes. Is it probable? No. Everyone needs a little spice in life. So here is one approach for individuals to consider when allocating equity investments: Put at least 80% of your money in passively managed index funds as a core holding, and invest the remainder—up to 20%, depending on your taste for adventure— in active strategies that embrace one or more of the approaches outlined above. The overconfidence effect is a well-established bias in which a person’s subjective confidence in his judgments is reliably greater than the objective accuracy of those judgments, especially when confidence is relatively high. Despite decades of empirical evidence, popular books on the subject (including classics such as A Random Walk Down Wall Street and Winning the Loser’s Game), and a simple, logical proof explaining the arithmetic of active management, the investing public—aided and abetted by the full force of the financial services industry—still believes it can do the mathematically impossible: beat the market (after costs).